Around a hidden corner in Kyoto’s Gion, along a street only navigable by foot, lies a tiny ryotei that is gaining notice. Here, the owner-chef, who learned his craft at one of Kyoto’s fine ryokans, serves classic kyo-ryori with a poetic and modern sensibility. 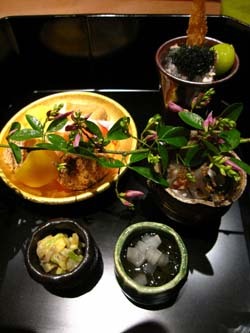 His eponymous ryotei was upgraded from one Michelin star to two in 2012. On a recent trip to Kyoto, we sat with new friends at the eight-seat counter (there are small tables upstairs) enjoying prime views of this young and humble chef at work. In the other seats were kimono-clad regulars, and after they departed a tall dancer from Tokyo, (also in kimono), was lucky enough to drop in without a reservation. The meal lasted for three hours and was declared by one of our friends as "the best meal" of her life. This is completely understandable, for the meal was outstanding. 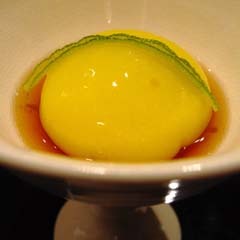 After a cup of gingko nut cream, the eleven-course meal started by gazing upon a moon: Floating in a bowl, a delicate moon-shaped sphere of yellow corn kuzu was topped with a sliver of fragrant sudachi rind in the shape of a half moon. The sauce, made from tosa-su (a gentle and flavorful vinegar) gave a sharp counterpoint to the meltingly soft, creamy texture and slightly sweet flavor. This was unlike any tsukimi dango (moon-viewing dumpling) I have ever tasted. Next was creamy fig dengaku with uni (sea urchin) and miso, served alongside a bite-sized salad of wakamizuna (baby mizuna), chrysanthemum leaves, simmered peanuts and precious matsutake mushrooms. 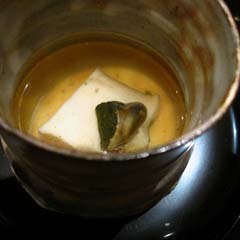 The wanmori (soup course) featured hamo, matsutake and sesame tofu. 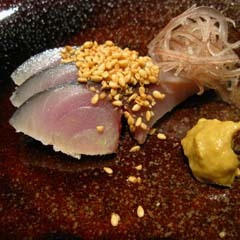 Two sashimi courses came next, including sanma (pacific saury) with tosa and myoga, sprinkled with sesame seeds. 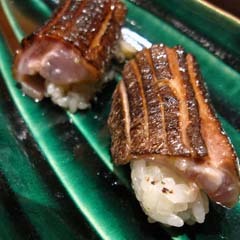 Then, sanma appeared again, in sushi form, lightly seared to bring out the oil and heighten its umami. The hassun course was a visual delight and arrived on a simple black lacquered tray sprayed with water to reflect coolness during the warm nights of early autumn. 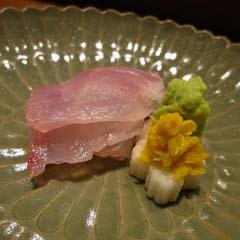 Highlights included tamago (egg) sushi and other suprises such as rakkyo fried with kakino tane (a popular kind of rice cracker) and cream cheese marinated in miso and rolled in katsuobushi (shaved dried amberjack). 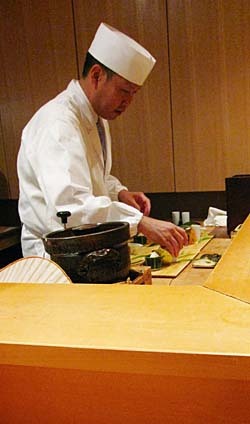 Above: Chef Matayoshi serves a handlful of lucky diners at his serene, counter-style two-Michelin-starred ryotei. Above: The hassun platter of late autumn. Below, the gohan course. Gion Matayoshi is located on the eastern edge of Gion, close to Higashiyama-dori, south of the Yasaka shrine. Dinner courses start at 11,000 yen. By reservation only. 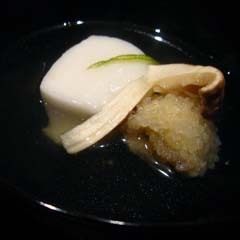 Above: From top to bottom, left to right: Tsukimi dango, fig dengaku, wanmori, sashimi. Bottom: Sanma sashimi, sanma sushi, sanma tempura, abalone in broth. 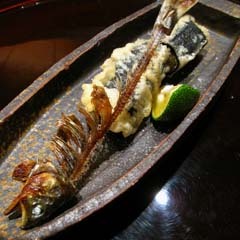 Sanma appeared again, in a poetic tableau filled with gravitas, like a 17th-century Spanish still life: Atop a boat-shaped plate, the de-boned (and deliciosly crunchy) skeleton served on top of the delicate meat - floating to a remind us of our fleeting existence. After a succulent slice of simmered awabi (abalone) came the gohan (rice) course, which was particularly delicious. 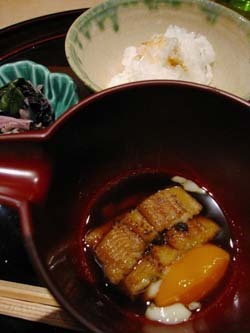 The rice was served with simmered anago (sea eel) in a rich and flavorful sauce topped with a soft egg yolk and sprinkled with sansho (Japanese pepper). The dessert was a pleasant suprise, and reminded us of the spectacular French dessert served at Yukawatan Bleston Court in Karuizawa. 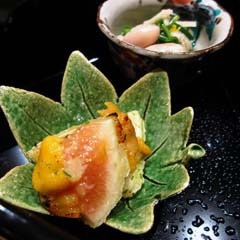 Ryotei meals typically end with a piece of fruit, but here, a sampling of exquisite miniatures was served on a pine platter. 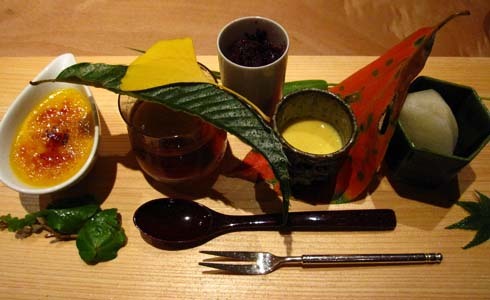 Pictured above, from left to right, amid a colorful autumn scene: Kabocha (Japanese pumpkin) cream brulee; fig in white and red wine jelly; blueberry sherbert with peeled grape and nashi (Japanese pear) with cream anglese. Throughout the meal, we were surprised and delighted by unexpected avenues and approaches to seasonal ideas. Tied deeply to the culture, yet refreshingly modern, Matayoshi skips the cliches and gets directly to the heart. Here, the diner can experience a new way of seeing: A modern mitate (a tea ceremony concept to see with new eyes).